At LTM Group our people are our greatest asset. They make us who we are - a team of highly skilled site operatives and trained stonemasons committed to high quality craftsmanship and customer service. LTM’s philosophy is train as we are trained and educate as we are educated. Since 1999 LTM Group have trained and nurtured a total of 26 stonemason apprentices and 5 of our key site managers have been put through the Society for the Protection of Building’s (SPAB) Fellowship Scheme. Our annual apprentice scheme benefits from Historic Scotland’s exemplary training centre base at Elgin Cathedral as well as our own unique In-House Training Programme. Over the years LTM Group has also hosted students on a variety of programmes including Historic Scotland’s Building Conservation Fellowship scheme, the Quinque programme (USA) the Society for the Protection of Buildings (SPAB) Scholar and Fellowship and other Craft Skills from across mainland Europe. This wealth of training and expertise represents the revival of the stonemason apprenticeship for the 21st century journeyman. This translates into unparalleled technical and practical knowledge which directly feeds into our site projects and preserves our high standards of work. 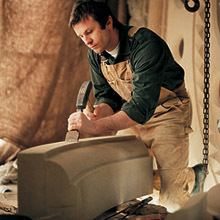 Steven Laing started his stonemasonry career with Historic Scotland in September 1989 at Elgin Cathedral. Steven achieved awards over four consecutive years during his City & Guilds courses and represented Aberdeen Technical College at inter-city masonry competitions in Edinburgh and Glasgow. 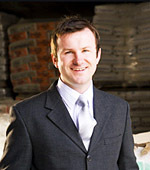 Steven graduated from Robert Gordon's University, Aberdeen with an HNC in Building in 1996. Steven undertook the William Morris Craft Fellowhip in 1997, an award scheme aimed at broadening the skills and experience of trained craftsmen involved in historic building repairs. Laing Traditional Masonry was established in February 1999 specialising in the sensitive repair and conservation of historic and ecclesiastical buildings. Steven’s focus on efficient and effective professional service combined with an excellent standard of workmanship has placed LTM Group at the forefront of the conservation industry in Scotland. Steven also regularly delivers Lime Mortar training courses to a variety of organisations; The Scottish Lime Centre Trust, Building Limes Forum and Scottish Traditional Skills Training Centre to name a few. More recently Steven and his company have received recognition in the fields of craftmanship for the Natural Stone Awards and for Environmental Awareness in the Civic Trust Green Apple Awards. Steven has also been awarded recognition in the Balvenie Artisan Awards.